Swiss rolls are normally a dessert or cake, however this one is a main meal. It combines cream cheese, pine nuts, semi sundried tomatoes, parmesan, spinach and red capsicum, as the filling. This needs to set for at least 2 hours so is an ideal recipe to make a day ahead. Quite an unusual taste, it is very filling and delicious. First, dry fry the pine nuts till they go slightly brown, or bake them in the oven. Put the red capsicum, skin side up, under a high grill and grill till the skin begins to burn. Take out of the grill, cover with glad wrap, and when almost cool, pull the skin off and cut the capsicum into small pieces. Using a Swiss roll pan (about 35 cm x 25 cm), line this with baking paper. Preheat the oven to 170° fan forced. Melt the butter in a medium pan, add the flour and cook, stirring for about a minute. Gradually stir in the milk and stir until the sauce boils and thickens. Remove from the heat and stir in the egg yolks, parmesan cheese and some pepper. Beat the egg whites in a medium bowl until they are stiff, and then gently fold the cheese mixture into this. Carefully pour this into the Swiss roll pan and sprinkle with the extra parmesan cheese. Bake for about 15 minutes or until the dough is set and starting to turn golden. Turn carefully onto a tea towel. Remove the paper and allow the sponge to cool completely. Combine the cream cheese, herbs, pine nuts, tomatoes, and salt and pepper in a bowl. Spread the sponge with this cream cheese mixture. Top with a single layer of the baby spinach (microwave it first for a minute to just wilt). Then add the red capsicum pieces. Using the tea towel, carefully roll up the sponge from the short end as you would with a Swiss roll, thus enclosing the filling. Put in the fridge for at least 2 hours to set. 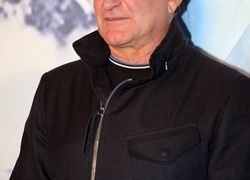 Did you like Robin Williams and which is your favourite movie with him in it? 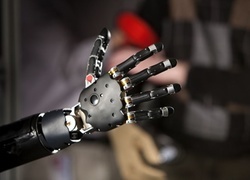 Would you accept bionic body parts to prolong your life? This looks great, but I would be hesitant to try it because it sounds almost too similar to the roulade. Is it worth a try? I'll have to give it a go...with chilli too!